As Will began sharing parts of the book with me, I decided to read it too . . . That's when our whole lives began to be turned upside down . . . About 10 days ago! I learned that the reason diets don't work is because we are all so different. Most of us have a messed up digestive system, making it impossible to get all the nutrients out of our food, that is if we are actually feeding our bodies real food! So, our first order of business was to eliminate COKE and chips, and cut down on our carb intake (bread, pasta, rice, white potatoes, things with flour and sugar). I said cut down, not eliminate! Our bodies are very smart! When they encounter "junk food", chemicals, toxins . . . Anything the body can't use, it stores them in fat cells to protect us. The idea is, the liver will get back to them later to ultimately remove them from our bodies. The problem is we overwork our liver by eating too many sugary, starchy foods, add over the counter drugs, prescription drugs, to that add toxins from the air, land, in our homes, at work, and our food and the junk it can't eliminate, it stuffs in our fat cells! Our liver just plain needs a break! That's where lowering our carb intake can help give the liver time, while we sleep, to deal with the toxins and we in turn lose weight . . . At least that is the premise! Another very important area is getting our digestive system working so our food gets broken down properly into nutrients that can be absorbed by the body. If that isn't working well, we will be hungry all the time. That's our body's way of telling us it needs nutrients, not another cookie, soft drink, candy or chips, but real food to keep us healthy! There are several ways to tell if you are having problems with your gastrointestinal system (digestion). Excessive burping or flatulence after a meal, heartburn or acid reflux, constipation, diarhhea, or bloating are sure signs. Many times what people think is too much stomach acid is actually the opposite, and their food is sitting in the stomach. 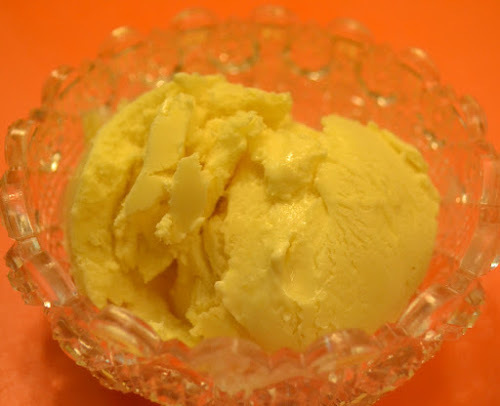 I created this super lemony ice cream to keep us moving in the right direction, without bruising our psyches too badly. This delicious dessert is low carb if eaten in moderation. My recipe makes 8 cups. That's 16 half-cup servings. 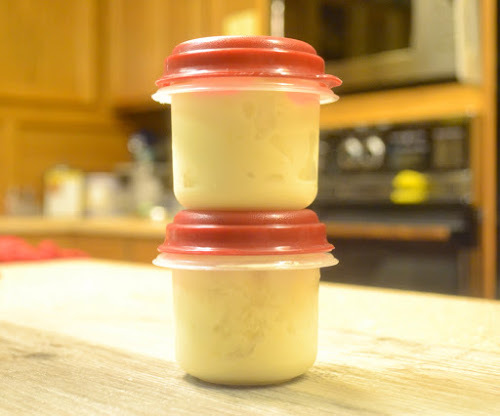 To make it easier to control servings, I put our ice cream in convenient 1/2 cup containers. I don't know about you, but it's easy for me to blow through a whole pint container in one sitting! Half-cup containers make it easier to control portions. 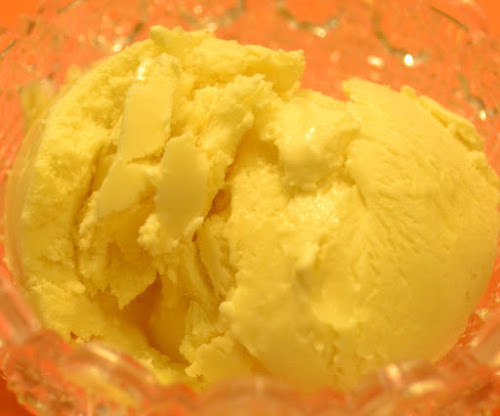 EASY, LOW CARB ~ LEMONY CUSTARD ICE CREAM - 11 carbs per half-cup serving. Wash and zest lemons; squeeze lemons for fresh lemon juice. In a large bowl or 8-cup measuring bowl add 2 eggs; whisk well. Add remaining ingredients; whisk together; cover bowl. Allow ice cream mixture to mellow in the fridge for at least 3 hours or overnight. I do 1/2 the ice cream mixture at a time, because this makes a full 8-cups. Follow your ice cream maker's instructions. Hard to believe that's a half-cup of Low Carb ~ Lemony Custard Ice Cream! You know how they say it's easier for men to lose weight? Sad, but true! Will- lost 9 lbs. in 9-days! All that aside, Will and I are on a Journey to Better Health. One of the bonuses is we will lose weight in the process. I'm looking forward to over-all better health, more energy, less pain, sharper minds, elimination of prescription drugs, over the counter meds with all their side effects, and on to new adventures . . . Over at Julie's and beyond!!! You might be thinking, "How will this affect her blog?" I will still have tasty recipes! I can't wait to share my pan fried wild cod recipe with you, or the lamb shanks I made, hobo style . . . Over at Julie's!!! Tart, lemony, custard goodness and only 11 carbs!